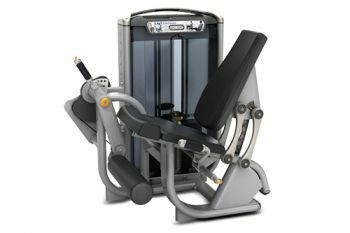 This modern leg extension machine is specifically designed to target the quadriceps, the large muscle group located on the front of the thighs. The seat and back pad angle increases your comfort and encourages full quadriceps contraction. With a weight stack of 240 lb (109kg), this leg extension has a standard range-of-motion adjustment and a self-adjusting tibia pad for an individual preference. You can track your progress using the electronic counter which displays repetitions, exercise time and rest time. The correct alignment of your body is encouraged by the marked pivot location on the machine.